This hike begins on Forest Road #2904 at the trailhead for both Tongue Mountain to the north, and Juniper Ridge to the south. 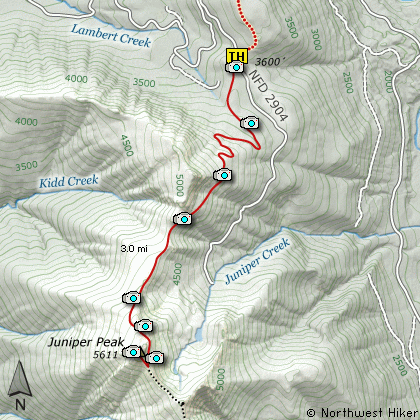 To reach Juniper Peak, head south on Trail #261. This trail, as all others in this area, is open to motorized vehicles, so you will find the trail V shaped from the bike tires. Please be understanding and courteous to all bikers you encounter. This is the only area where they are allowed to enjoy their form of recreation. The trail spends the first half of the distance to Juniper Peak working its way uphill through densely forested areas. In season, this entire hike can be a mosquito heaven. About 2 miles into the hike and about 1500 feet higher, you will begin to break out of the dense forest and have spectacular views. It is the views that draw a hiker to this ridge and peak. In season this hike is a floral garden. 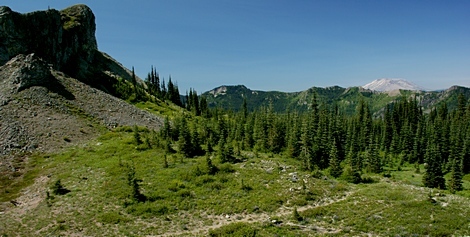 Hike to the far end of Juniper Peak itself before ascending, if only to enjoy the spectacular views in all directions. Once on top, you can choose any safe path back down to the trail and then return the route you came. Travel east on US Hwy 12 for about 48 miles to Randle. From Randle, travel south on State Road 131, crossing the Cowlitz River and in a mile you will come to Cispus Road on your left. Bear left and follow Cispus Road, which become Forest Road 23, for another 5.2 miles and you will pass Forest Road 55 on your left. Continue on FR23 for another mile and you will pass Forest Road 083 on your left, which is the road to Layser Cave. But you keep straight ahead on FR23 for another 1.9 miles. You will then come to the junction of Forest Road 28. Turn right on FR28 and cross the Cispus River. A mile from SR23 you will come to the junction of Forest Road 29. Continue south on SR29 for another 3.7 miles and you will come to Forest Road 2904 on your left. Turn left onto FR2904 and follow it up a steep and bumpy 4 miles to a saddle where you will see the Juniper Ridge trail crossing SR2904. Park here to hike to Tongue Mountain to the north or Juniper Peak to the south.